41 mm polished and satin finish stainless steel case, screw-down yellow gold crown with the TUDOR rose engraved and lacquered in black and a black anodised aluminium winding crown tube, unidirectional rotating yellow gold bezel with 60-minute graduated matt black anodised aluminium disc and gold markings, domed sapphire crystal, black dial, Tudor calibre MT5612 self-winding movement with date at 3 o'clock, approximately 70 hours of power reserve, aged leather strap. Water resistant to 660 ft (200 m). 41 mm polished and satin finish stainless steel case, screw-down yellow gold crown with the TUDOR rose engraved and lacquered in black and a black anodised aluminium winding crown tube, unidirectional rotating yellow gold bezel with 60-minute graduated matt black anodised aluminium disc and gold markings, domed sapphire crystal, black dial, Tudor calibre MT5612 self-winding movement with date at 3 o'clock, approximately 70 hours of power reserve, stainless steel and yellow gold bracelet. Water resistant to 660 ft (200 m). 41 mm polished and satin finish stainless steel case, screw-down yellow gold crown with the TUDOR rose engraved and lacquered in black and a black anodised aluminium winding crown tube, unidirectional rotating yellow gold bezel with 60-minute graduated matt black anodised aluminium disc and gold markings, domed sapphire crystal, champagne domed dial, Tudor calibre MT5612 self-winding movement with date at 3 o'clock, approximately 70 hours of power reserve, black aged leather strap. Water resistant to 660 ft (200 m). 41 mm polished and satin finish stainless steel case, screw-down yellow gold crown with the TUDOR rose engraved and lacquered in black and a black anodised aluminium winding crown tube, unidirectional rotating yellow gold bezel with 60-minute graduated matt black anodised aluminium disc and gold markings, domed sapphire crystal, champagne domed dial, Tudor calibre MT5612 self-winding movement with date at 3 o'clock, approximately 70 hours of power reserve, steel and yellow gold bracelet. Water resistant to 660 ft (200 m). 41 mm polished and satin finish stainless steel case, screw-down yellow gold crown with the TUDOR rose engraved and lacquered in black and a black anodised aluminium winding crown tube, unidirectional rotating yellow gold bezel with 60-minute graduated matt black anodised aluminium disc and gold markings, domed sapphire crystal, black domed dial, Tudor calibre MT5612 self-winding movement with date at 3 o'clock, approximately 70 hours of power reserve, brown fabric strap. Water resistant to 660 ft (200 m). 41 mm polished and satin finish stainless steel case, screw-down yellow gold crown with the TUDOR rose engraved and lacquered in black and a black anodised aluminium winding crown tube, unidirectional rotating yellow gold bezel with 60-minute graduated matt black anodised aluminium disc and gold markings, domed sapphire crystal, champagne domed dial, Tudor calibre MT5612 self-winding movement with date at 3 o'clock, approximately 70 hours of power reserve, brown fabric strap. Water resistant to 660 ft (200 m). 41 mm polished and satin finished steel case, yellow gold screw-down crown with black-lacquered and engraved tudor rose, black anodised aluminium winding crown tube, unidirectional rotating bezel with 60-minute graduated matt black anodised aluminium disc and gold markings, domed sapphire crystal, domed black dial, Calibre MT5612 self-winding movement with bidirectional rotor system, approximately 70 hours of power reserve, brown aged leather strap, folding buckle with safety catch. Water resistant to 200 m (660 ft). 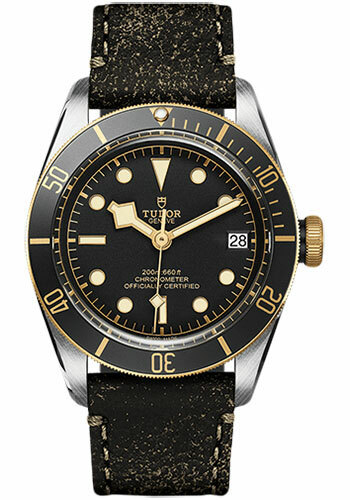 41 mm polished and satin finished steel case, yellow gold screw-down crown with black-lacquered and engraved tudor rose, black anodised aluminium winding crown tube, unidirectional rotating bezel with 60-minute graduated matt black anodised aluminium disc and gold markings, domed sapphire crystal, domed black dial, Calibre MT5612 self-winding movement with bidirectional rotor system, approximately 70 hours of power reserve, steel and yellow gold bracelet, folding buckle with safety catch. Water resistant to 200 m (660 ft).